There is a lot more available to the player from the very start of a new file. From Virtual Reality, you should have access to every weapon, weapon set, music track, scenario, game option, and Simulant type (with the ability to use up to eight). Two new levels are available in VR... Bunker ii and Archives. They are (mostly) complete with glass, doors, metal crates, and all the weapons you can handle. The Simulants perform very well, and are able to fully traverse the stages. The only hiccup lies in the metal crates. They'll eventually drop through the floor after being destroyed and disappear for the remainder of the match. It may take a few cycles for it to happen, however. There's a very special treat in this release. Expertly ported from The World Is Not Enough on the N64, the "Labyrinth" multiplayer map by Zoinkity. 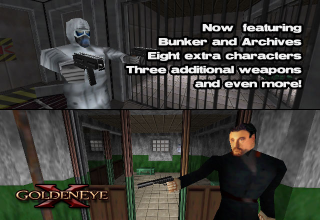 He's brought this fun level over to GoldenEye, which was then converted for Perfect Dark and updated to have more spawns, additional ammo crates, Capture the Flag bases, and even five Hills. It's a brand new experience for those not familiar with TWINE, and a great bit of nostalgia for those who are. Get your hands on some new hardware! Take out your opponents in stealth by using the silenced variations of the PP7 Special Issue and D5K Deutsche. The destructive Shotgun is also now at your disposal. Like some of the other weapon ports, the muzzle flashes and bullet origins aren't perfect, but the weapons themselves and their positioning matches the originals. Once we learn more about how the weapons in PD are setup, these issues will be taken care of. An additional eight bodies and five heads have been added to the character roster. Choose from the Russian Soldier, Jungle Commando, Siberian Guard (Black) [which also completes Mishkin], or Siberian Special Forces. Feeling invincible? Than select Boris as your on-screen persona. Want to use some voodoo magic against your foes? Baron Samedi is just waiting to put on a hex. And whether you're tall or short, there's somebody for you. Jaws and Oddjob, the polar-opposites in GE, are ready to duke it out again... whether you want your friends to use them or not is up to you. From the first patch, the Moonraker Elite has been using a customized arm/hand model. Since then, the other characters have been matched up with more appropriate models. Most of those have also been customized, since PD only offered so many styles. There's a couple that still require better textures, but the majority of characters are complete. Simulants are now fully supported in the Caves map. 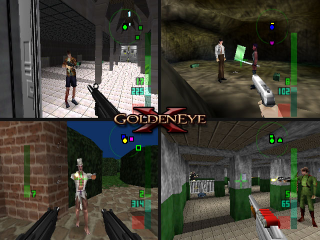 Thanks to a base AI Path Network created by Octan Baron for his custom mission in GoldenEye, Sims are capable of navigating all areas of the stage. Hopefully this will breath new life into a level that most would consider to be the least appealing multiplayer choice in GoldenEye. Egyptian has seen some architectural modification since the last release. There are three chutes that normally contain ceiling-mounted drone guns in the mission. They have been edited and changed into ramps. It was a decision made to better performance, for both humans and Sims. Before, people were capable of falling through the lower edge of the chute and dying. As a ramp, this occurance is eliminated. Simulants now use these ramps without any issues. The left-handed Phantom and Sniper Rifle now draw correctly, and not inside-out. Their bullet origins are still inaccurate, but the Phantom does have a slightly improved muzzle flare. It also uses the appropriate sound effect, and has been adjusted to better replicate the original. The Sniper Rifle has also been slightly modified, and now deals the same amount of damage as in GoldenEye. The AR33 Assault Rifle and RC-P90 are now capable of penetrating through objects and characters. I'm not sure why they weren't setup by Rare to do this in the first place, but it has since been fixed. Certain doors in various levels weren't using the proper flag to prevent them from being seen through walls. Those that appeared in Temple, Facility and Egyptian are now all taken care of. Others also close portals when shut, which may help slightly with the framerate in certain areas. The glass in Facility is now, once again, indestructible. You may still fire through the glass with a weapon capable of penetrating through objects, so beware of Sims who are packing an AR33 or RC-P90. Two songs have been removed and replaced in the Virtual Reality soundtrack list. Silo X didn't loop, and once finished, would continue on in silence. The End Credits theme was taken out, since it was never included in the original game's multiplayer soundtrack. Both Elevator songs (from Control and Caverns) have been included as their replacements. For those of you who are able to play this game on console, through the use of a backup device, you'll be pleased to hear that both Complex and Egyptian no longer crash during loading. There was an error in the background file that didn't seem to cause any problems via emulation, but wasn't nearly as kind on the actual hardware. Both files have been updated, and are confirmed to work on console. HOWEVER, it is recommended that you DO NOT use GoldenEye character bodies and heads. There is a bug that is causing the console to crash when they are loaded into the level. It might not happen right away, but it eventually rears its ugly head. Only a few heads have been confirmed to play properly, but none of the bodies. So, until this is sorted out, please stick to the Perfect Dark leftovers. The Character Profiles & Other Information in the Information Room, as well as the Vehicles listed in the Hangar PC, have begun taking after their GoldenEye replacements. All of the characters (with exception to Ourumov and Valentin) are available to view, but the informative articles have yet to be dealt with. Also, most of the vehicles are still displaying the PD objects, and not all descriptions have been written. These things are being left in to demonstrate the progress we're making outside of Virtual Reality mode. And be sure to check out the Official GoldenEye: X YouTube channel for the patch 3a trailer. A great multi-player alternative to Perfect Dark and GoldenEye 007. We've gotta move these colour TV's!